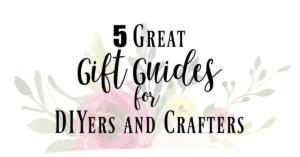 This is a post that I have been looking forward to writing for quite some time! Not only is it an accomplishment to finish making over a room but it also means that we are getting closer to our little’s arrival. I’m looking to get induced next Thursday or Friday so hopefully by next weekend we will have our precious little girl in our arms! I am so proud of this room and I can’t wait to share it with you! This might be my new favorite room in our house, that’s a good thing as I’m sure I’ll be spending lots of time in here! 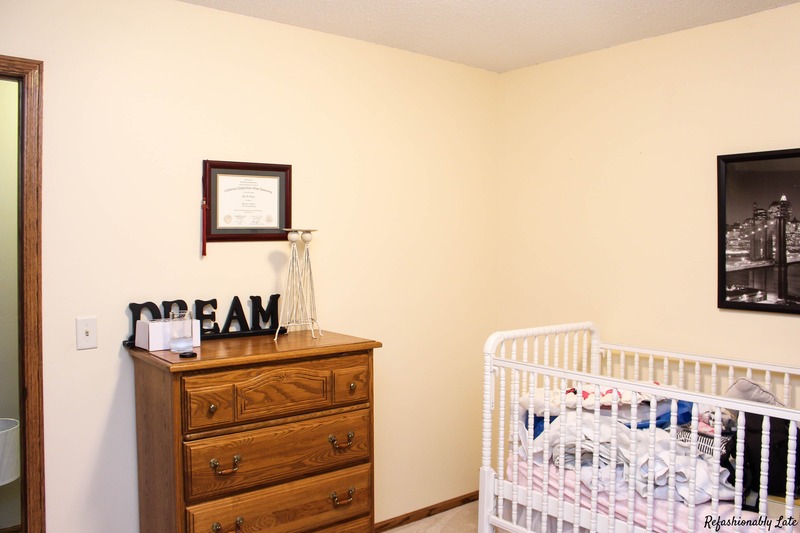 Not only did I decide to tackle one makeover for the One Room Challenge but I decided to two rooms! I also gave our Master Bedroom a mini makeover! I’m very happy with how the room turned out and I’m so thankful for all of my sponsors that helped make this room possible. 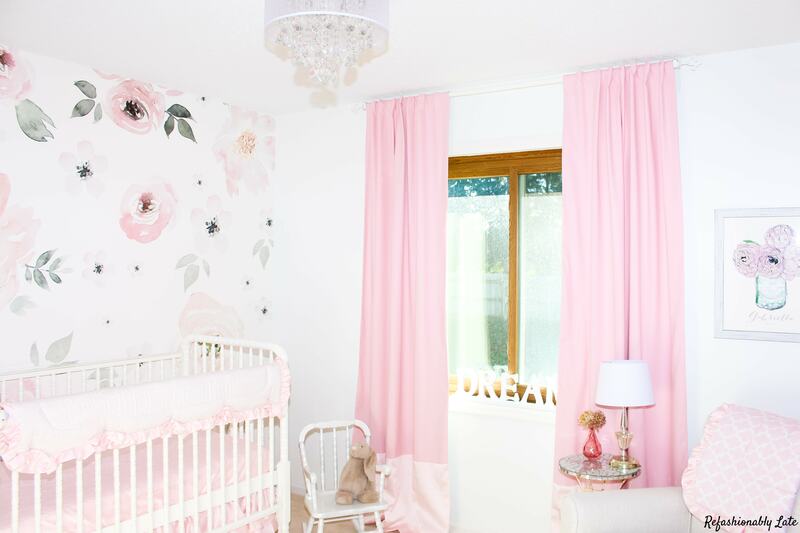 This bedroom is fit for a princess! Alright here is some photo overload for you!! 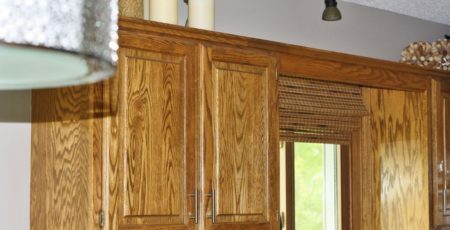 Here’s a closer look at the before and after with our bathroom transformation. Slide the arrow back and forth to see the before and after photos. I’m so happy that this room is finished and I’m absolutely in love with it’s transformation! Now it’s just a waiting game on the arrival of our little girl! Have a great Wednesday everyone and I’ll see you later this week for another post or two! 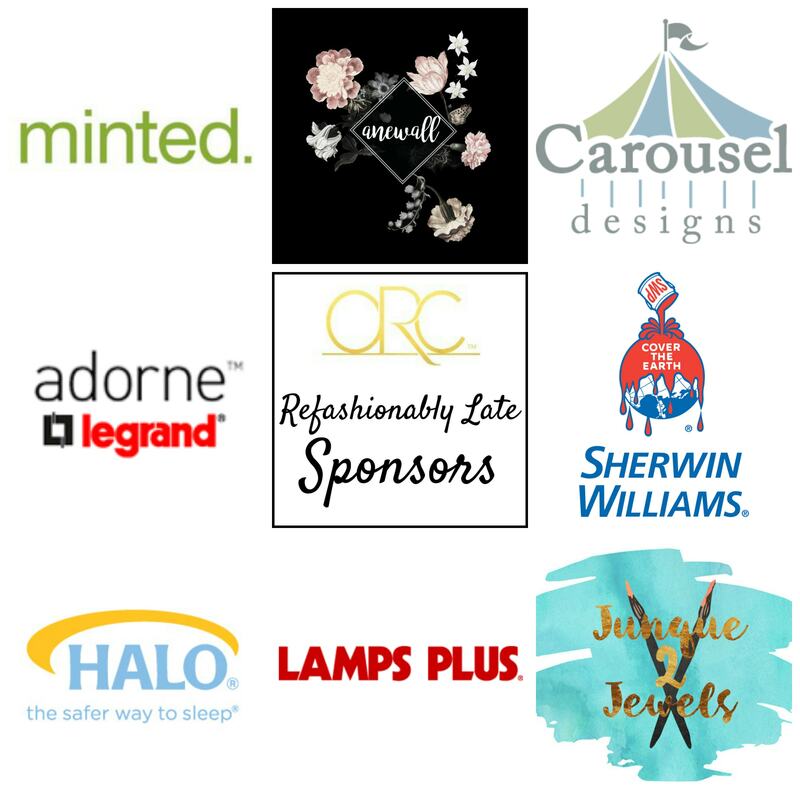 This post contains affiliate links for your connivence. See my full disclosure here. this is so beautiful! 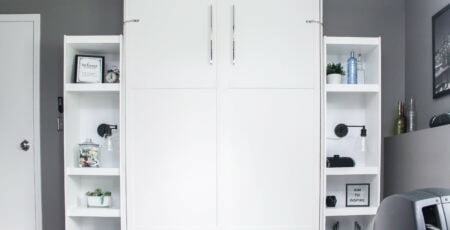 i LOVE the wallpaper so much and the closet looks amazing, too. 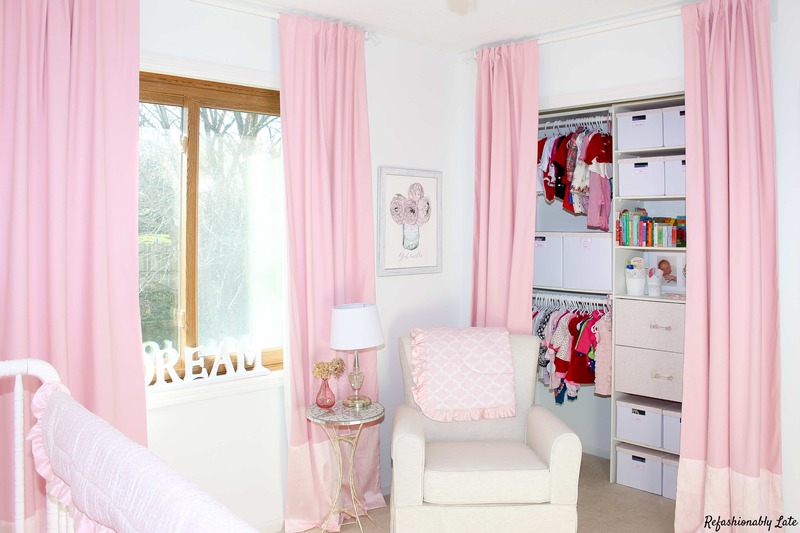 what a gorgeous precious room! Thank you!! I’m so glad it’s finished and now I can just enjoy it! 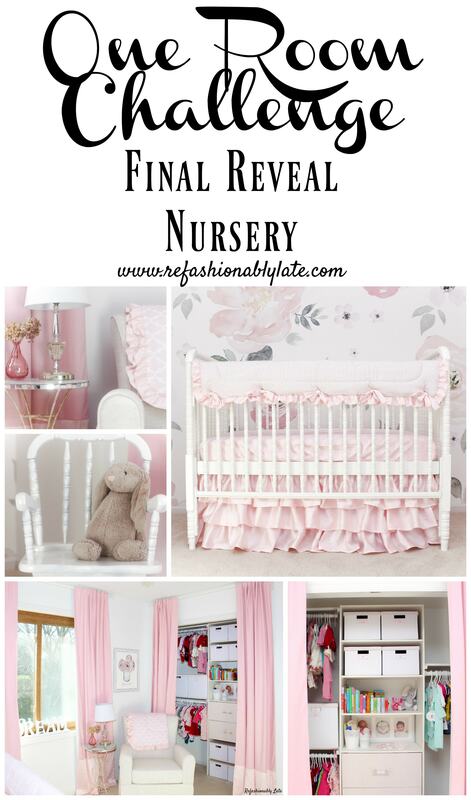 Oh Ruthie, this is the perfect nursery for your little princess on the way! I’m so excited for you and your family. That wall paper is just incredible. So fabulous that you’ll be spending a lot of time in this beautiful new space. Congrats on a job well done! Thank you so much Tee! I love it so much! Oh my goodness! SUCH a sweet little space! That wallpaper is incredible!!! Thank you Kristi! I love it so much and can’t wait to bring our little girl home to it! Seriously gorgeous!! I love that wallpaper and all the little details! Great job! This room is absolutely beautiful! The wallpaper looks amazing! Thanks Barbara!! I’m so excited to bring our little girl home to it! It’s beautiful! I LOVE the wallpaper! Thank you Erin!! I love the wallpaper so much! That wallpaper is absolutely stunning! I LOVE how this room turned out! I still can’t get over that wall. It totally has my heart! Haha I’m right there with you! So cute! I love the wallpaper. 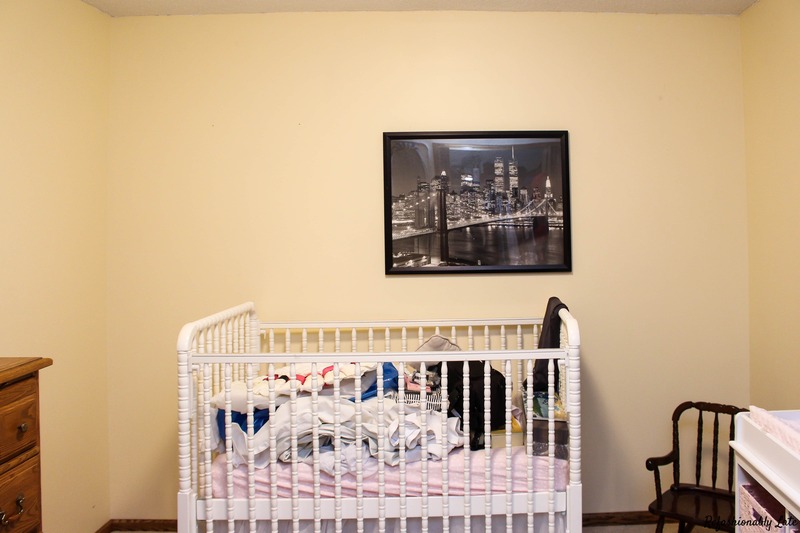 You did an awesome job Ruthie…move in ready, no stress. I’m seriously obsessed with that wallpaper. 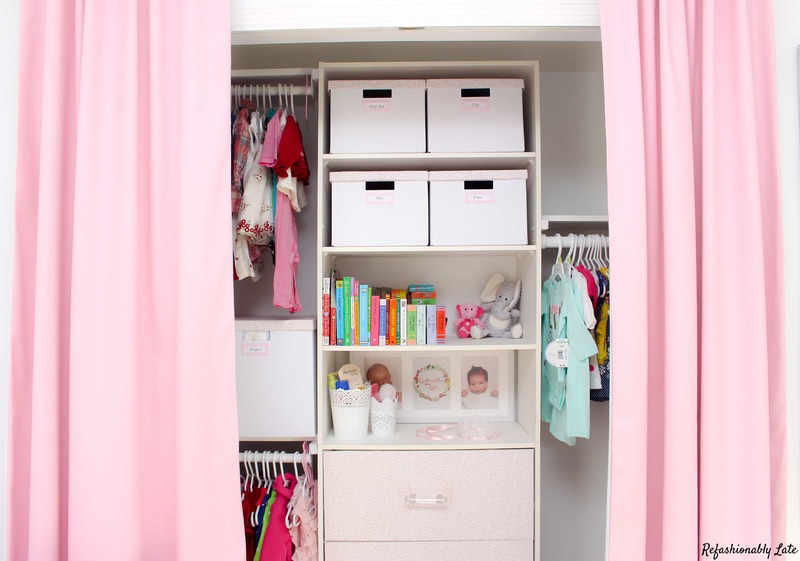 It’s all so beautiful and perfect for your baby girl. Thank you Katy! 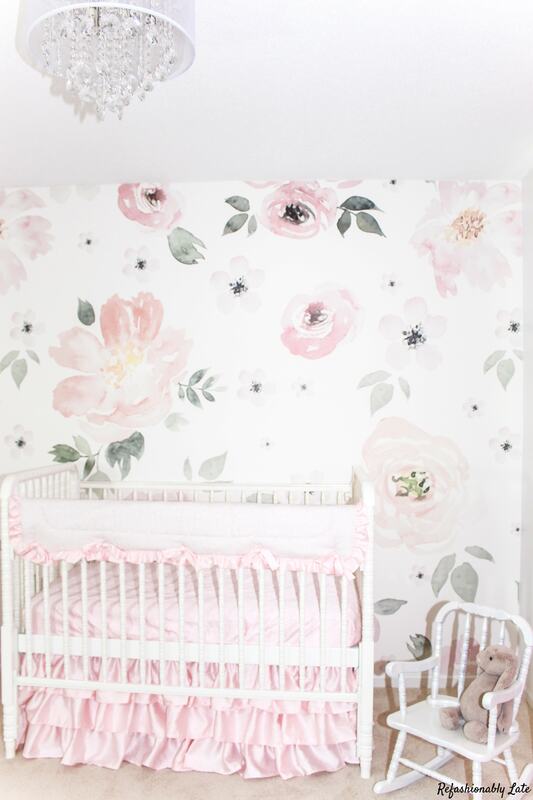 I’m obsessed with the wallpaper too! Beautiful job! I can’t tell you how much I love that wallpaper! Sweet space, love that wallpaper! Thanks Maggie! I love the wallpaper too! 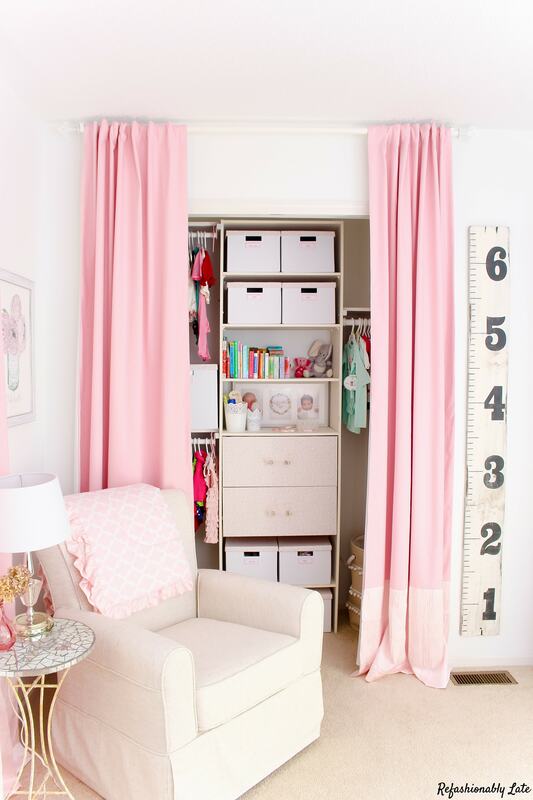 OK so I’m obviously in love with pink, and therefore this room is a space after my heart <3 so many thoughtful little touches that make this space a knock-out! 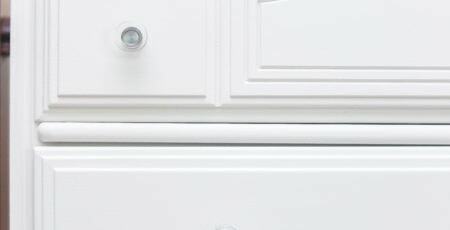 I love the wallpaper on the drawer fronts. It's all fantastic! Thank you so much Ariel! I so appreciate all your sweet comments! 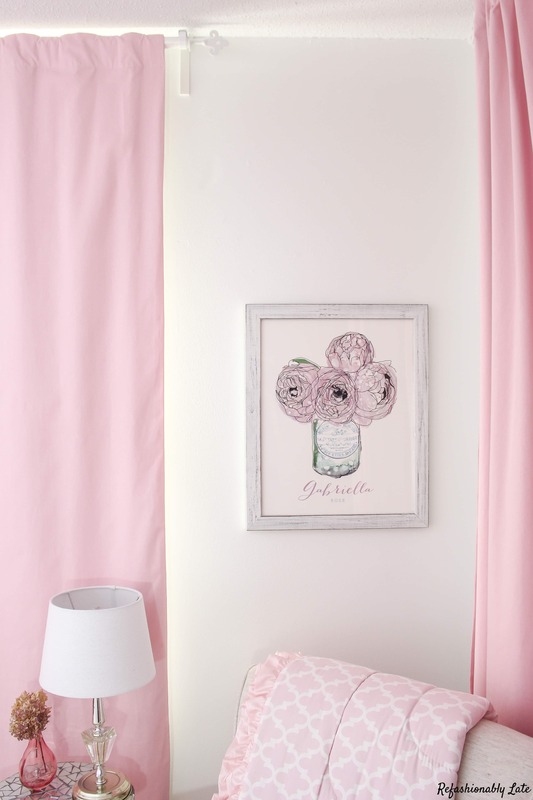 That bedding and that wallpaper – LOVE!! 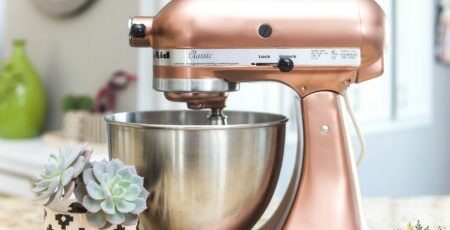 It’s so pink and fun and girly, I absolutely love it. Thanks!! I love how girly it is too! Thanks Erin! I’m really enjoying the room with our new bundle! The floral wall is everything!! Love it. 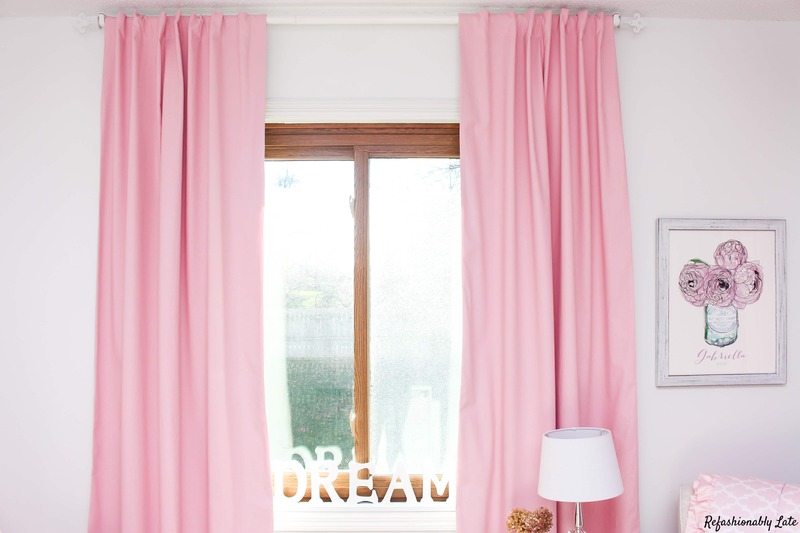 And I love that you have those pretty pink curtains on the closet, too! Good luck next week!! Will be such a lovely space to bring her home to! You guys did such a great job with this room! 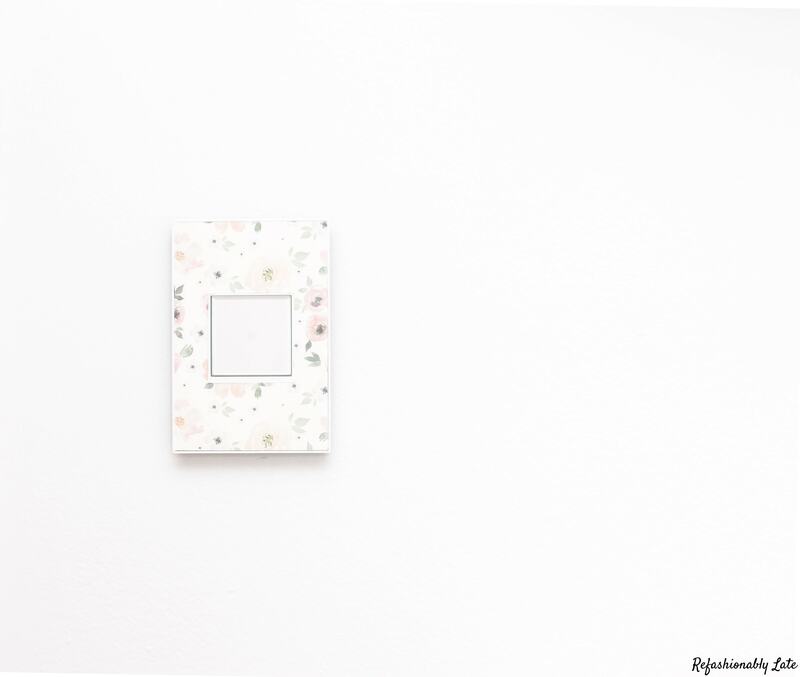 I love the wallpaper–and I like that you only did it as an accent wall, too! Can’t wait to meet the new baby girl! Thank you Brittany! 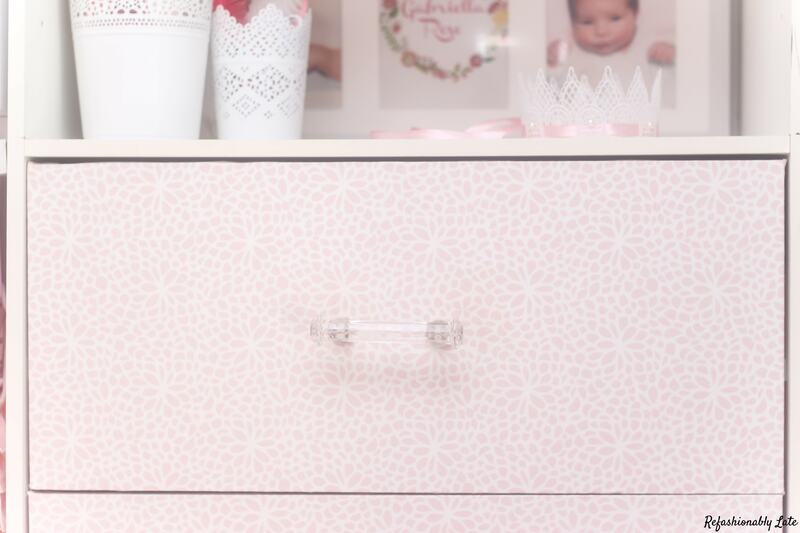 I love the wallpaper so much and I’m so pleased with how this room turned out! So sweet! <3 What a transformation! Such a sweet space! I love the wallpaper so much! I bet you just go and sit in there. It’s so pretty! I did and still do find myself just sitting in the room admiring it! The wallpaper mural wall is stunning!!! So so pretty! It’s such a sweet and darling space! I LOVE that wallpaper. Great job! Thank you Amy!! I love the wallpaper too! What a sweet room! A dream for any little girl! Congrats on this amazing transformation!! Thank you! 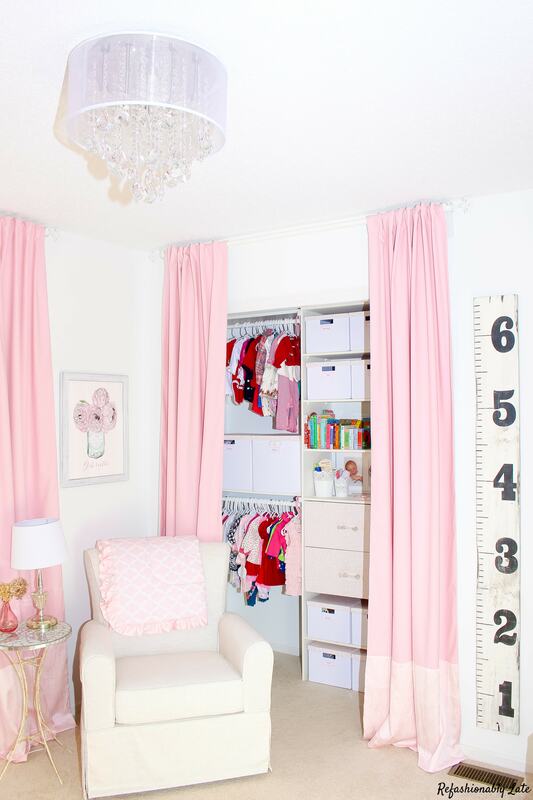 I love how sweet this room is. Tonight I just sat down in the room while rocking my little girl and soaking in how much I love the room! 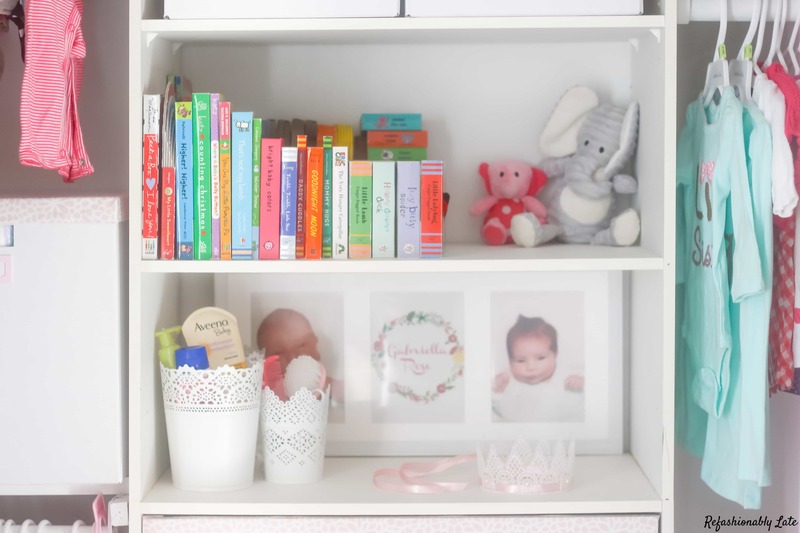 Your nursery is gorgeous, and so nicely organized and all ready for your little girl!! 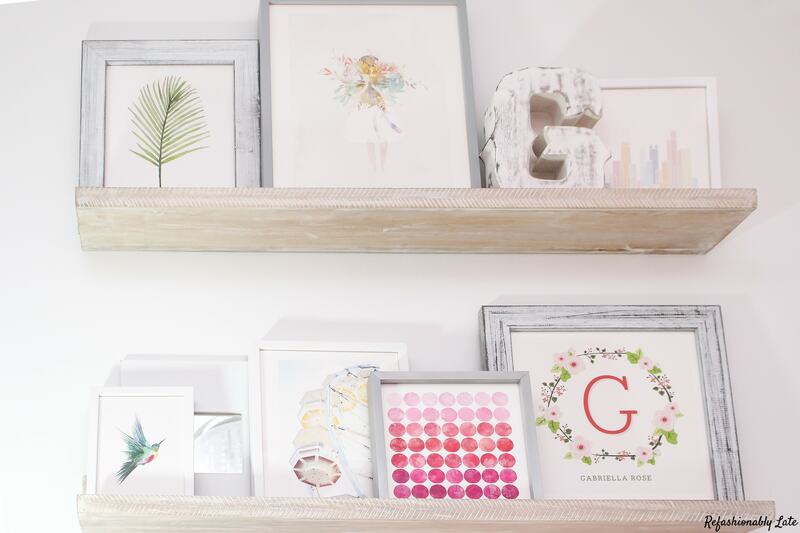 I just makes me feel relaxed looking at it all, which is a great vibe for a nursery! Such a sweet room. That wallpaper is amazing! 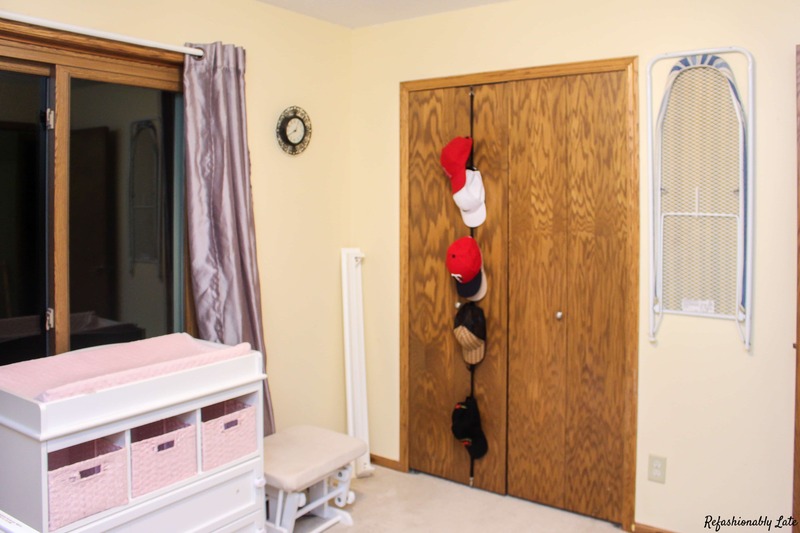 You are brave taking on two rooms, especially being so far along in your pregnancy! I’m doubly impressed! Praying for a smooth delivery and that you have your baby girl in your arms soon! Thank you so much Denise! I love how the room turned out! That wallpaper is perfection! Love it! Thank you! I love the wallpaper too! 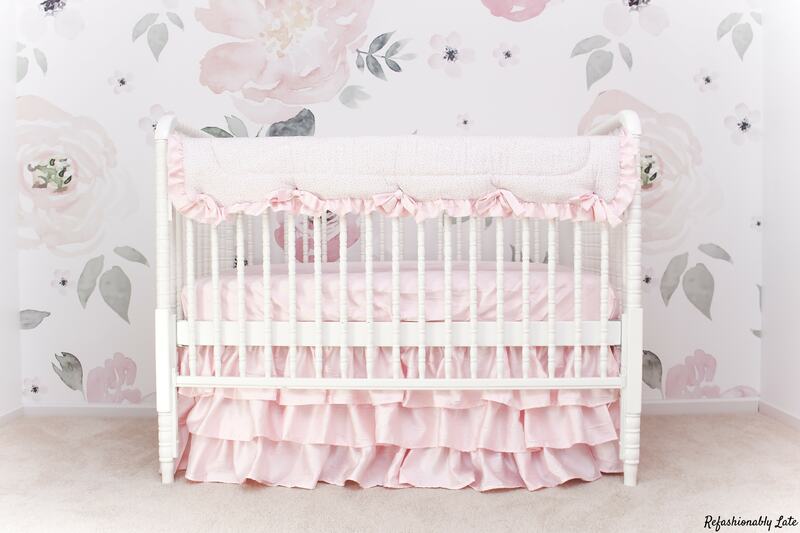 I adore the wallpaper and the ruffled crib skirt! 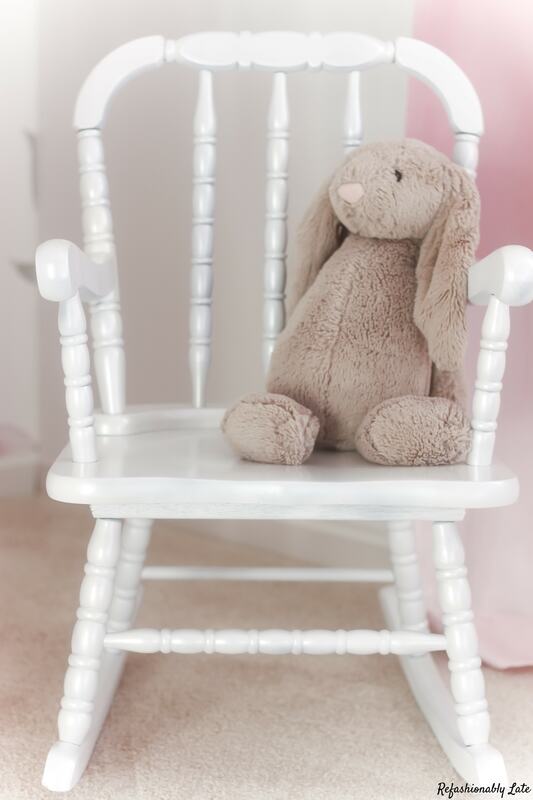 The whole makeover is just perfect for a sweet little miss! 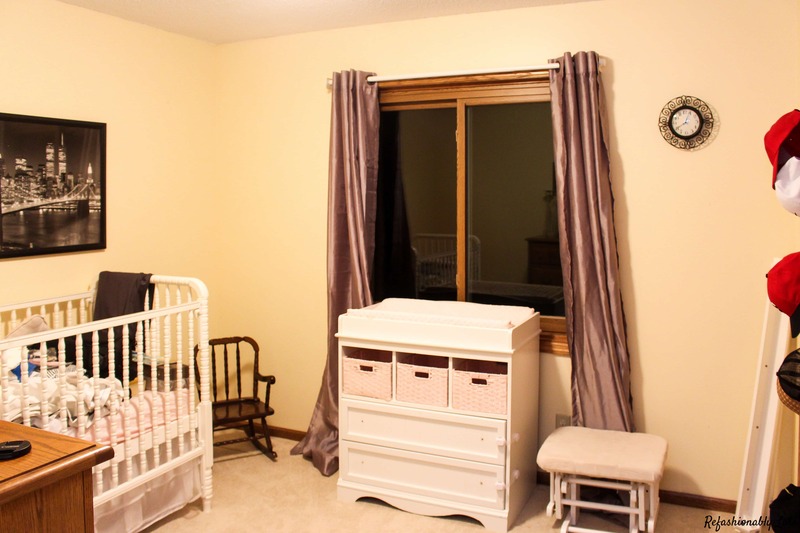 What an adorable room. I love that wall paper. Great job and wishing you an easy delivery of you little girl. So exciting. Thank you! I can’t wait to bring her home to it! 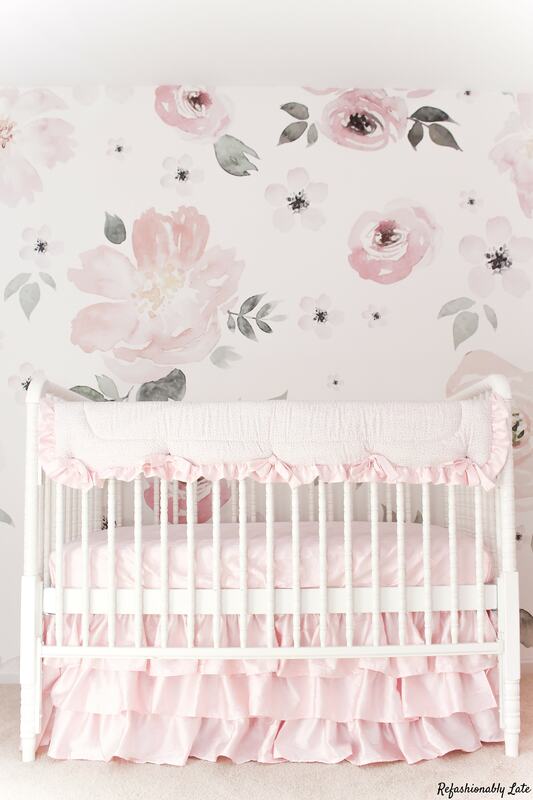 What a beautiful nursery! I love that wallpaper you chose! Thank you so much Carol! I adore the wallpaper! Thank you Iris! I’m really looking forward to it! You’re SUPERWOMAN!! I have no idea how you managed to tackle TWO spaces for this ORC but I bow to your awesomeness! 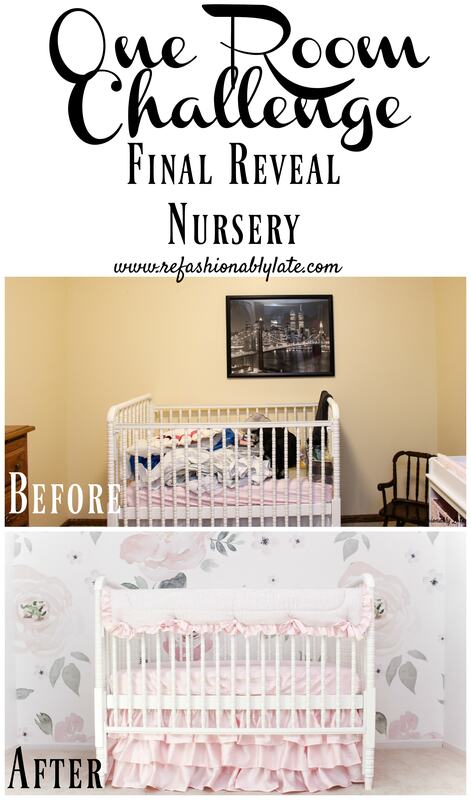 This nursery is fabulous! 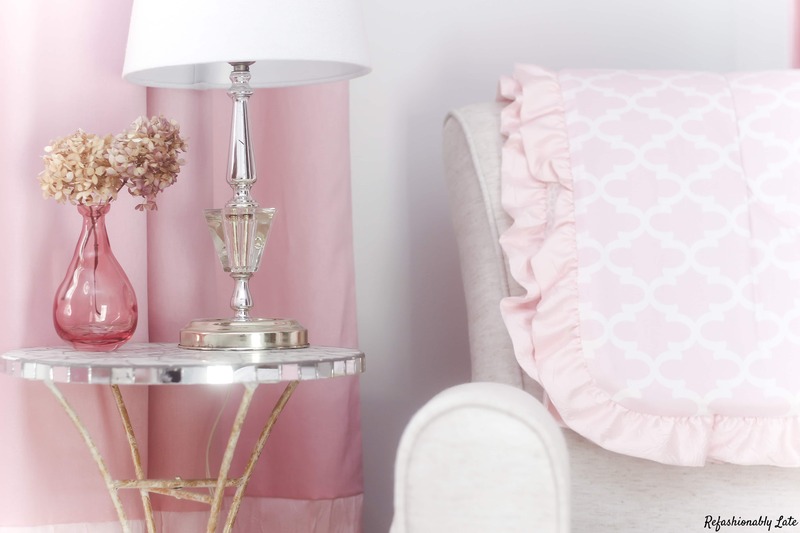 So sweet and pink and pretty and girly!!! It’s absolute perfection! 🙂 Really, really great job!